Arun Ghandi hopes to spread the philosophy of non-violence. 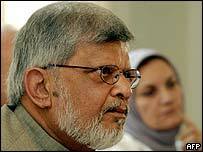 Arun Gandhi, grandson of former Indian leader Mahatma Gandhi, is visiting Palestinian territories and Israel to spread the message of non-violence. Mr Gandhi will launch a strategy of unarmed, popular protest adopted by a Palestinian peace group. He is to meet Palestinian President Yasser Arafat as well as Israeli peace activists during his six-day visit. "I have come here to convince people of my grandfather's philosophy of peaceful resistance," he told BBC News Online. "You need to concentrate on a policy of non-violence for the long-term, not resorting to violence when it suits," he said. Mr Gandhi also criticised Israel's controverisial security barrier, saying, "This reminds me of something you might see in apartheid South Africa. The walls surround cities and towns, choking the people - it's not right." Israel says the barrier is necessary to stop attacks by Palestinian militants. Mr Gandhi has also announced he will fast for a day in support of thousands of Palestinian prisoners currently on hunger strike in Israeli jails. He is set to speak at rallies in the West Bank towns of Ramallah and Abu Dis and visit the Israeli memorial to the holocaust, Yad Veshem. The Palestinian Campaign for Freedom and Peace hope to spark a popular protest movement along the lines of the 1987-93 'intifada'. Protests then took the form of civil disobedience, general strikes, boycotts on Israeli products, graffiti, and barricades. Terry Boulata, a schoolteacher from Abu Dis and member of the new group told BBC News Online: "The means of resistance is the change. We want to increase participation in the struggle. "When we just react to Israeli violence with violence, militant groups gain control of the resistance. "We hope Gandhi's message of non-violence will create new ways of resisting the occupation." However, some Palestinians do not agree with Mr Gandhi's message. Ghazi Hamed, editor of Palestinian magazine Al-Risaleh, told the BBC that the problem was not on the Palestinian but on the Israeli side. "When we try to demonstrate peacefully we are faced with tanks, rubber bullets and assassinations. "Sometimes we have to make the Israelis understand that we are not weak people."